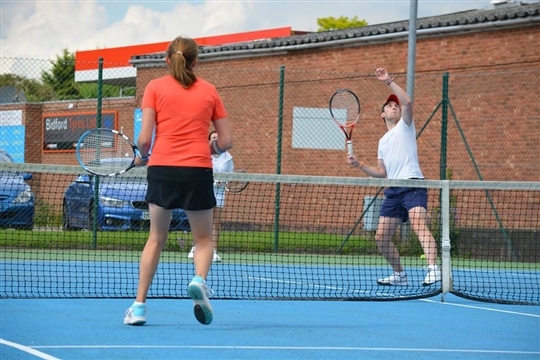 Welcome to the Bidford Tennis Club Website. Whether you are a new member looking for information on how to join, or an existing member looking for upcoming events, you will find it here. We are a club with a long tradition. For us, it's not all about serious training; we love it when our teams win, but we're just as enthusiastic about our groups that simply meet for fun. We don't differentiate between our members; anybody is welcome to join. Our qualified trainers are team members, just like anyone else, and will be happy to tell you more about the sports activities we offer, and help you find the place that is right for you. We are always happy to welcome new members who are interested in joining in with club activities, helping us organise events or excursions, and being part of our community. Find out how to join the club on our Adult Membership or Juniors pages. If you want to try your skills out first, please go to the Play page.